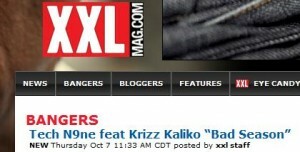 Tech N9ne’s recently-leaked track “Bad Season” from the upcoming Bad Season mixtape made XXL’s “Bangers” section on their website. The page has a player to listen to the track. Click here to check it out and show your support for Tech N9ne.